Check for d7 Updates – This is where you update D7, and optionally, EVERYTHING else. d7 – This one is obvious! d7 (Pre-Release) – Like a BETA, this is usually a release used for testing purposes before final releases are uploaded. Sometimes this is bleeding edge and packed with new features, but usually this release is pretty far behind the final release. 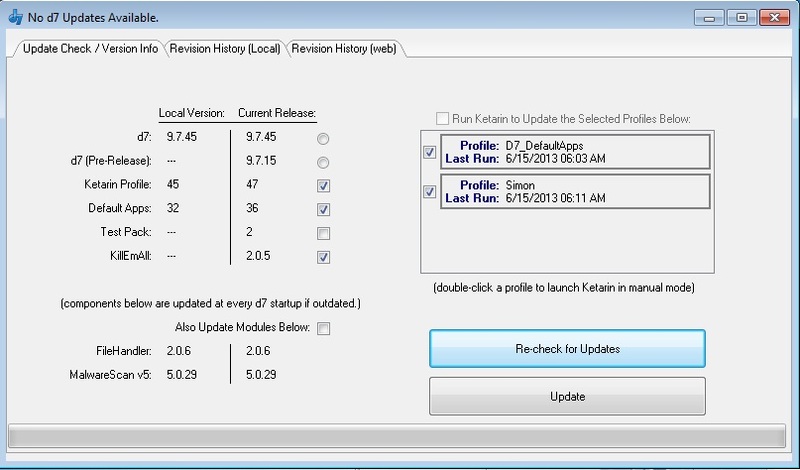 Ketarin Profile – This is the d7_DefaultApps profile in the Ketarin window to the right. Updates to this item are moderately important. Default Apps – This contains the default 3rd party apps configuration that d7 uses, such as CCleaner, TDSSKiller, etc. etc. Updates to this item are extremely important! Also Run Ketarin to Update the Profiles Below – This option of course will execute Ketarin silently and automatically to update all checked profiles in the window below it. This option really makes the next option obsolete, which is….